Can’t find an Innovative venue? Create your own Pop up Shop in 15 Minutes! In the ever growing diverse world of events, the competition between brands to create the most exciting and interesting displays, shows and pop up stores, is immense! With such a high level of competition between brands, it is starting to get very difficult for companies to create a lasting impression. Creating a lasting impression is vital in gaining new followers, leads and customers – as well as keeping existing ones interested. Having to consider many factors like cost, usability, ease of access, set up times and unique appeal, it can often be hard to find the perfect venue that ticks all of the boxes. The worst outcome when trying to source a venue for your pop up shop or event, is finding one that seems perfect only to then find it’s booked up on the dates you require or is way out of your budget. When you’re unable to find a suitable venue, have you ever considered creating your own Pop up Shop or Venue that can be set up in just 15 minutes? The X-GLOO range of inflatable structures are growing to be an ever more popular Inflatable Event Structure option and are ideal portable venue solutions used as Pop Up Shops or promotional events. The X-GLOO is a striking inflatable event tent designed with the iconic shape of the igloo in mind. 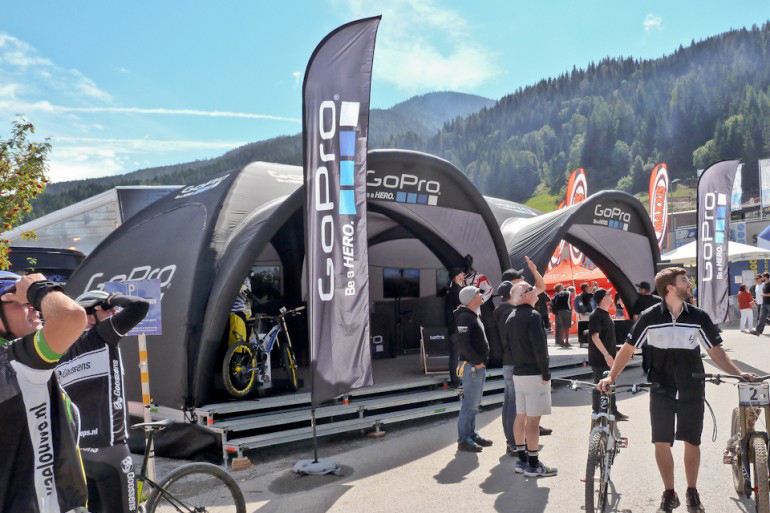 Offering limitless customisation and brand potential, the X-GLOO is a sturdy solution for any company looking for a striking and eye-catching presence at events. Sturdy and resilient, the tent is more than suitable for both indoor and outdoor occasions. The X-GLOO features a unique block building system that allows you to create almost any design and inflatable structure by adding multiple X-GLOO UK tents together. Almost every surface of the X-GLOO tent and the accessories can be branded and customised to suit your branding and marketing messages. Constructed from a strong nylon and polyester material which is waterproof, fire retardant (B1 certified), UV resistant and can withstand winds up to 60 km/h Beaufort scale 7 (additional weight ballasts required). Once inflated, the X-GLOO can be used on almost any ground by using the hard and soft ground anchoring systems. The X-GLOO tents are available in a range of sizes including 4x4m, 5x5m, 6x6m and 8x8m inflatable tent. The large footprint means these events tents are a perfect venue for larger products and can be suitably used as promotional car tents. The X-GLOO is an extremely portable venue choice for businesses and brands alike. The entire structure deflates to fit into a specially designed surprisingly small rucksack that weighs from as little as 13.13kg depending on size of structure. This means not only do you have your own fully branded, portable venue, you can easily transport your pop up shop across the globe without the worry of incurring huge transport costs! Are you ready for your very own fully customisable portable Pop Up shop venue solution? !